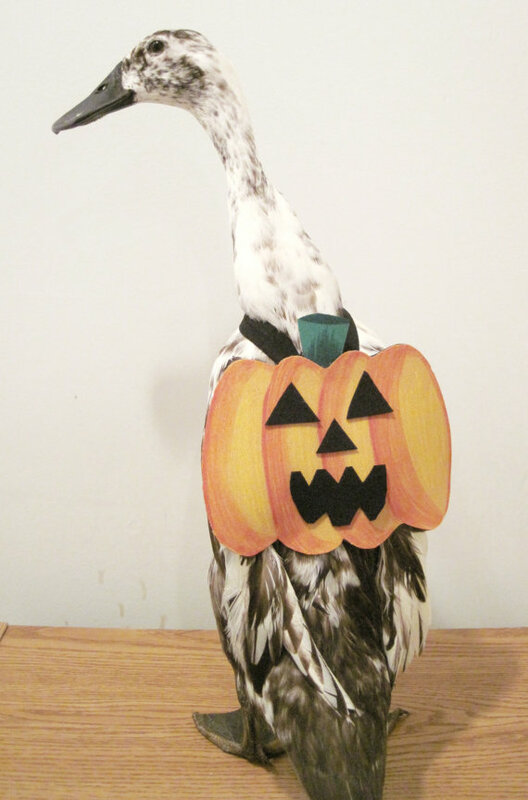 Our vet was strongly encouraging me to enter one of our geese, chickens or ducks into a costume contest at the local nursing home. "We have so many cats & dogs, but far too few 'exotic' animals... consider it, please? The patients would love it..." I did consider it, but honestly, I couldn't think of much other than putting a paper crown around Queen Moe's tuft on the top of her head. 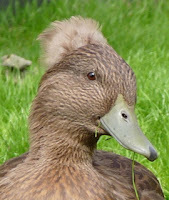 The other thought was how I was going to catch a duck, goose or chicken if it got out, and the bedlam that would ensue. The weather turned chilly for a few days last week. Dug out a Winter work jacket one morning, and realized that I still hadn't fixed the broken zipper. No problem, just close with a couple of small spring clips - no one around to notice but the chickens, right? Then one morning Spouse & I were in a rush to get the animal chores done so I could drive him to the airport. Finish up, hop in the car, go-go-go... then we stopped at Buc-ee's for a quick coffee & gas fill-up. I get out of the car, smiling at all the folks who were looking at me, and then look down... yeah. Still had on that Winter jacket with the bright, day-glo spring clamps closing the front. Err, oops. Can't take me anywhere. So now that the employment contract has ended, I've time to do more than just maintain the farm. I'm getting bags of free veggie trimmings from the in-town co-op again, and creating more compost. I usually take out and feed to the birds the known "likes": tomatoes, lettuce, fruit. This time, thought I'd try something different. After taking out all the known goodies, I put the remainder of the veggie trimmings into a kiddie pool (after taking out things like raw onions, which are bad for chickens) and let the birds have at it, watching carefully to see what they liked or ignored. Surprised to see that celery was a big hit with the geese, as well as purple cabbage. Didn't realize there'd be another surprise waiting for me a few hours later: blue-green goose poo, all over the front porch. No more purple cabbage for the girls, thankyouverymuch.